A sticky note is a small piece of paper with adherable strip of glue that you can use to attach notes to documents or any other surface such as a computer screen, a desk, a calendar, or even the fridge. Normally sticky notes can easily be removed and attached to any other surface and it was originally invented by 3M and named them “post-it” and available as small yellow squares, but nowadays you can find many different design variants including colorful sticky notes, custom shapes and different paper sizes. At SlideModel.com we have designed a collection of creative sticky notes templates that you can download and use in PowerPoint to attach notes to your slides using a sticky note style. This way, you can make original slide designs by annotating slides with authentic post-it styles. First of all, you need to find the sticky notes template that best fit your presentation needs. For this purpose, we have created sticky note shapes with design that look like small pieces of yellow paper with curved corners making it look authentic. 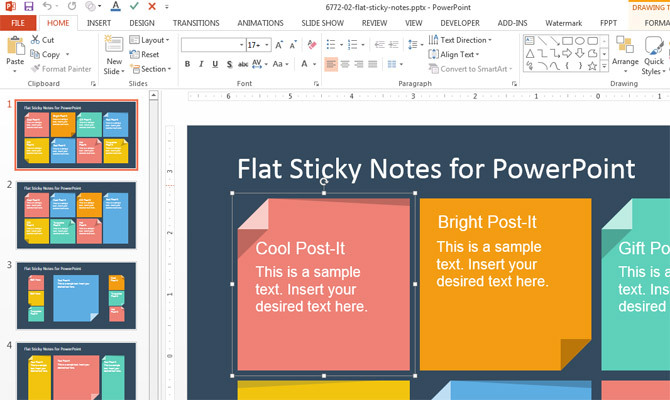 Go to Sticky Notes PowerPoint Template. Now, download the template and open the presentation in Microsoft PowerPoint. You can see there are several slides, each slide contains different versions and styles of the sticky notes. Find the sticky note shapes that best fit your needs. If you are using more than one sticky note in the same slide, you may try to use different sticky note designs in order to make the slide look realistic. 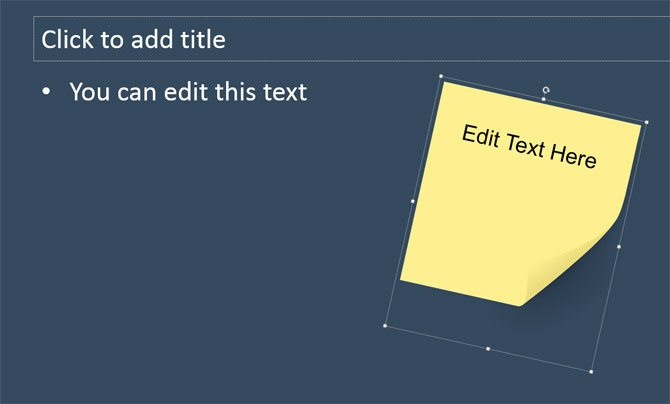 Copy and paste the shapes into your own presentations and now you can add a new text box on top of the sticky note shape with the text note. You may try to change the colors in order to make the slides look more impressing. 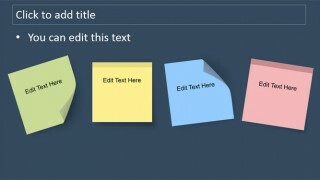 For example, by changing the sticky notes background color you can produce different versions that look like the following screenshot showing green sticky notes, yellow sticky notes, blue sticky notes and red sticky notes. Given that we have created the sticky notes as PowerPoint shapes, you can easily resize the shapes without losing picture quality. 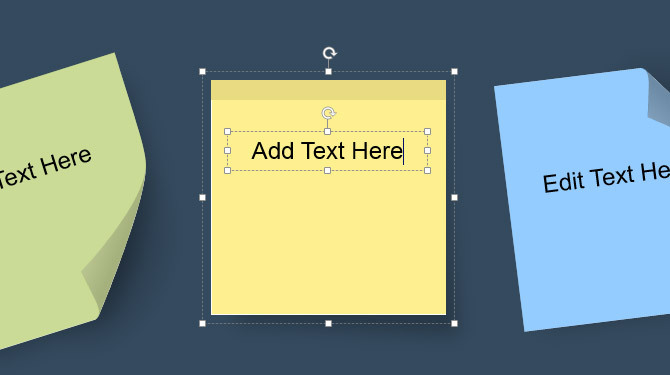 To add text to the sticky note it is recommended that you add a new textbox on top of the shape. It should look as follows. You can then rotate the shape to make it look really awesome. If you want to rotate the text as well, it is a good idea to group the sticky note shape and new textbox together using Ctrl-G in Windows so you can then rotate all the graphics with the same rotation angle. Alternatively you can use our flat sticky notes PowerPoint template with an original and creative style. It is inspired by the same sticky notes but using a modern flat design instead. This flat post-it template design contains many different slide designs with colorful sticky notes and long shadow design. 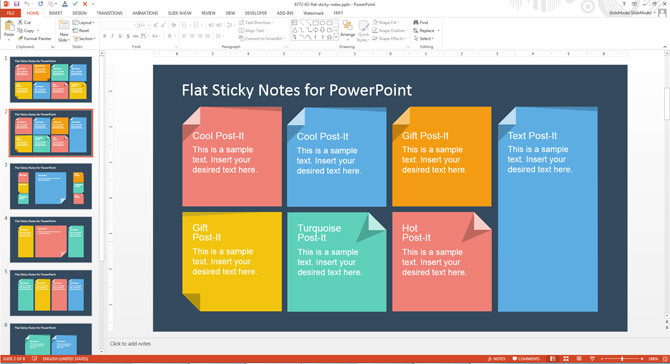 Using the same approach described earlier, you can copy and paste each individual shape into your own slides to add sticky notes to your PowerPoint presentations. The benefit on using the flat sticky notes PowerPoint template is that we have added text boxes inside each shape and you can easily edit the sticky notes text content to add your own content. If you are looking for cool presentation ideas to enhance your presentation slides then we encourage to try annotating your slides with sticky notes.